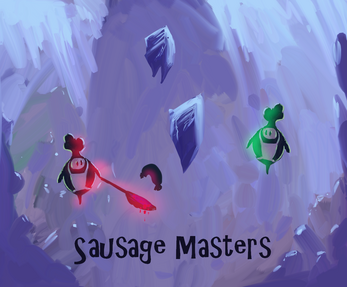 Two French cooks from outer space have decided to play with a super sausage ! The one who will accomplished to put the sausage in the final plate will become the sausage master ! Watch out, don't burn the sausage too much ! The sausage cooks when it's on one of the frying pans. Throw the sausage in the rings to score points : black rings give you 50 points, red rings give you 150, but will accelerate the sausage! Be careful not to drop it when it's on your side of the screen, or you will lose points. Throw the sausage in the final ring to score points based on the sausage cooking status. Be careful : you'll lose points if the sausage if too over/undercooked. Have fun! Controls : currently supports the Leap Motion for player 1, otherwise you'll need a joystick. Unfortunately, the two players need to share the joystick and play with one of the sticks... Drop me a comment if you're experiecing problems and we'll try to fix them! You can also use the keyboard, default keys are ZQSD for player 1, and OKLM for player 2. Update : I fixed the upload and added builds for Linux and Mac OS X. Also some little tweaks, and updated the controls.